May sit alone. Turns and twists in all directions and turns head freely. Enjoys rolling from stomach to back, and back again. May start creeping, with her tummy still on the floor. By eight month she may start crawling and can pull herself to standing. Transfers an object from hand to hand easily but doesn't know how to let go deliberately. Shakes things to see if they make noise. By eight months baby starts picking up small objects between thumb and forefinger and may put it in her mouth. Drops things from her highchair, playpen or crib and wants them retrieved right away. Studies your face intently, touches it, pulls your hair. By nine months she may develop stranger anxiety especially if she has 1-2 caregiver. Eating takes on new appeal as your baby starts feeding herself by hand. She may be more interested in playing with food than eating it. Your baby's intelligence is increasing rapidly. She can now plan actions to get what she wants. For example, she may try harder to creep because she wants to visit the fish tank in the living room. Speech skills are developing. Even though your baby can't talk yet, she recognizes important words such as "Mommy," "Daddy," "bottle," "car," and so on. Your baby has a broader range of feelings and can express them with noises, facial expressions, and body language. She shows pleasure, excitement, love impatience, fear, distrust, and many other feelings. Your baby is becoming more curious and adventurous, but this is balanced by fear. He'll leave you to explore but come back often to touch base. Your baby is starting to use his fingers rather than his whole hand to investigate objects. Your baby's mental powers are growing. For example, he knows that hidden objects still exist even though he can't see them--and he'll search for them. "This is the house that Jack built … "
If Jack were building a safe house for his baby, he would look at every room and every corner through his baby’s eyes. It’s amazing how babies can get into everything. There are so many little things that you may not have noticed or thought about, and they’re exactly what baby wants to touch, taste and explore. So, you want to be sure that you have done everything you can to make your baby’s environment safe and sound. "Merrily we roll along, roll along … "
The safer you make your baby’s car trips, the happier you both will be. As much as baby might like the breeze, an open window is an open invitation to trouble. Keep windows near baby closed. Secure the car safety seat backwards until baby weighs 20 pounds. Then turn it around to face forward. Fasten the shoulder straps and seat belt snugly around baby. "Humpty Dumpty sat on the wall. Humpty Dumpty had a great fall … "
It’s so easy for babies to roll and crawl someplace that’s potentially dangerous. Baby loves to sit in a high chair or on the changing table where he can see the whole world! Remember to use safety straps, even if baby is sitting for just a minute or two. Baby reaches for everything in sight, but cannot judge distances. Prevent unpleasant tumbles and always keep your baby in sight and in reach. "Rock a bye baby, cradle and all … "
Select a crib and playpen that meet CPSC standards. Keep crib away from draperies and venetian blinds so baby will not get tangled in the cords. Avoid pillows and low-hanging mobiles. Federal regulations specify that crib slats can’t be more than 2 3/8 inches apart. That’s so baby’s little body can’t squirm through, but he can still see you! Avoid cribs with ornate carvings, nooks and crannies. Be sure corner posts meet the CPSC standard of less than 5/8 of an inch high. Sometimes baby wants to climb out of the crib. To ensure baby’s safety, keep the crib sides in the raised position. "Pease porridge hot, pease porridge cold … "
Even a bowl of hot soup may seem like a toy to baby. Be aware of hot ovens, fireplace screens, curling irons, and wood stoves. Do not heat your baby’s formula in a microwave oven, as it may result in serious burns to your baby and it may cause the bottle or bag to explode. Always dress baby in flame-resistant clothing. Baby is curious about containers. Use childproof caps and containers so baby can’t get the cap off and taste or spill the contents. Baby can’t distinguish substances that may be harmful, so pesticides, medicines, liquid cleaners, soaps and other products should always be kept in locked cabinets or out of baby’s reach. If you think your child has swallowed a poisonous substance, call the Poison Control Center immediately. Keep syrup of ipecac handy to induce vomiting, only if they instruct you to use it. "Old Mother Hubbard went to the cupboard … "
And she found a childproof cabinet lock, of course. Baby can get into anything, even if your back is turned for a second. Keep cabinets, cupboards, closets, and drawers secured with safety latches. 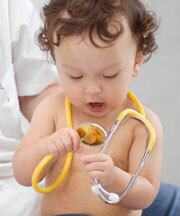 Poisonous or harmful items like some household plants or paints should be placed out of baby’s reach. Baby will be tempted to poke small objects in the holes of a wall socket. Use outlet covers to ensure baby’s safer exploration. Use cord shorteners and avoid baby’s tendency to chew on electrical cords or pull down on them. Be particularly careful of irons, even if unplugged. Keep baby’s favorite toys away from unsafe areas. During bath time parents are lifeguards. Never, ever leave baby alone in the water. Even if the phone rings, baby always comes first. "Rub a dub dub, three men in a tub … "
An inch of water is an ocean to a baby. Bath time is a special time for baby to play. Make sure that time is a safe time. Always stay with your baby and share every minute of fun. As baby gets older, he loves to play in the bathtub with toys. Keep the water level three inches or lower, so baby can splash around and play. When bathing baby, hold him with one arm and wash him with the other. Always keep the soap and towels within reach, so you needn’t let go of baby. Baby enjoys baths so much that a bucket of water, the toilet, or wading pools look good to him. Be extra careful to keep baby away from them. Monitoring the food baby eats to avoid choking is a never-ending job. Foods to avoid include whole grapes, hot dog chunks, nuts, and raw carrots. Small household items can get stuck in baby’s throat. Keep marbles, "button" batteries, paper clips, coins, and other small household objects out of baby’s reach. Plastic bags can seem like a source of fun to baby. They really are a source of danger. Throw them away immediately, or keep them far from baby. Although baby always seems to lose his pacifier, never tie it around his neck. It can get caught on something and strangle baby. Your baby will get DTaP, HIB, Rotateq and Prevnar. Most common side effects are pain at the site and fever. You can give them Infant Tylenol ____ml drops every 4-6 hours.